The Escape has gone from boxy to sleek in two generations. Everyone knows Ford is not about building cars anymore, as evidenced by the fact that the Fusion, Focus sedan, and Taurus are no more. Trucks, SUVs and crossovers are the order of the day, and Ford just pulled back the covers on the new Escape. Next to the F-Series truck family, the Escape is Ford's most important vehicle in terms of sales volumes. More important than the Explorer, Edge, and the Expedition. But the new one really does look like a car. Hrmm. There seems to be no element of ruggedness. Is this Ford's way of appeasing car-lovers? The new Escape is, well, totally new. That means Ford tore up the mold for the old one and started fresh. It uses their new global platform (yes, everyone's doing this to save on development costs) the new Ford Focus uses (that car isn't sold here, as mentioned before), and it's the very first Ford vehicle sold here that will use the platform. Though the new platform doesn't have a fancy new name yet, the new Ford front-wheel-drive scalable unibody architecture use more lightweight ultra high-strength steel and boron steel. The new Euro-only Ford focus contains 33 percent of both combined, compared to 11 percent in the old Focus. This means the Escape should be lighter and more rigid than before. The current-gen Escape was way overdue for a redesign since it began in 2012. Under the hood are four engine options, which include a 1.5-liter turbocharged three-cylinder base engine (with cylinder deactivation, so it can run on two-cylinders) with 180 horsepower and 177 lb-ft of torque, a 2.0-liter turbocharged four-cylinder with up to 250 horsepower and 275 lb-ft of torque (on 93 octane gas), a hybrid model, and an Escape plug-in hybrid, both of which use a 2.5-liter gas engine coupled with an electric motor. That last one is the most interesting of the four since that powertrain option was dropped for the last generation, oddly enough. There are no official figures for the plug-in hybrid's efficiency, but the goal is 30 electric-only miles, which should be class-leading, as well as industry-leading. It beats out the Kia Niro plug-in (22 miles) and the Mitsubishi Outlander PHEV (22 miles). From this angle, it looks a lot like the Mazda CX-5 but not as nice. 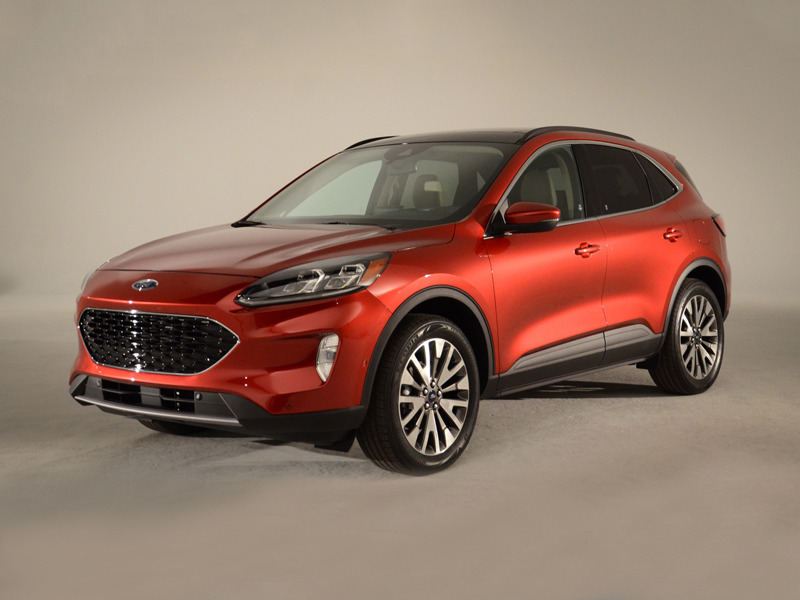 The 1.5-liter three-cylinder will be the standard engine on the three lower trim Escapes: S, SE and SEL models. The Hybrid powertrain will be standard on SE Sport and top-tier Titanium models. If it's more power you want, you can opt for the 2.0-liter turbo for the Titanium. Even better, the PHEV powertrain is available on every trim level except S. That 30-mile all-electric range should be a serious attractor. These dark mesh ellipsoid grilles are freakin' everywhere. How about something original? The inside of the Escape looks far better than any current Ford in terms of contemporary style that ditches some of the old-school aesthetics of current Ford vehicles. There's high-contrast 12.3-inch digital instrument cluster, a new rotary gear selector, and an updated SYNC3 infotainment system that ups the fanciness while hopefully retaining the current version's ease of use and responsiveness we love so much. Almost more important than the updated level of style inside is the huge second row, which slides back to provide 40.7 colossal inches of legroom. That's a big deal considering most crossovers this size have about 36-38 inches of legroom. That's a boon for taller passengers and should appeal to families who don't want to buy a three-row SUV. In terms of safety, Ford is copying Toyota with its Ford Co-Pilot 360 suite of safety features that's now standard on all trim levels. The suite comes with automatic emergency braking with pedestrian detection, blind spot information system, lane keeping system, rear backup camera, and automatic high beams. Features such as adaptive cruise control with stop-and-go, lane centering, evasive steering assist, and post-collision braking will be optional. The interior redesign is almost as dramatic as the exterior. There's no question the new Escape will be a hot-seller, and Ford absolutely needs this new vehicle right now since they've turned things upside down in their lineup. It should be the most car-like crossover in their model line, and it takes up the mantle from their sedans that have gone the way of the dodo. Our issue is with the somewhat boring design. Okay, it's not bad looking, but it seems conventional to us in a sea of crossovers that essentially look the same. Remember this guy? The 2010 Ford Escape Hybrid was pretty sweet. Returning to boxy may have been a better move, especially since their trucks sell so well. Plus, a more SUV-like shape would certainly stand out in the crowd. Just take a look at how attractive the new Kia Telluride is, and that one actually copies the old Ford Explorer. The rest of the crossover crowd pretty much resemble one another, so the Escape doesn't exactly break ground. We're not wowed by the new Escape, but we do think the redesign was long overdue.